Late last year and early this year, AR and I embarked on a project. No no, I don’t mean babies. I mean our kitchen renovations. We didn’t like it one bit either. Notice I didn’t have a pantry? Dried food was stored in a basket and exposed to the big bad world. So what happened when we have NO kitchen to cook from? Ah.. we used our handy bbq set! We also renovated our patio area a few months back and bought a bbq set to celebrate the event. Alas though, what we have is a 3 burner, hence slightly smaller than this one. Still, it has a wok burner which means I can actually do some stir frys. Grandma will be happy too-since she likes her gas cooking, while we still have no gas (only electric), this one will let her fry up all the sambal that she wants! 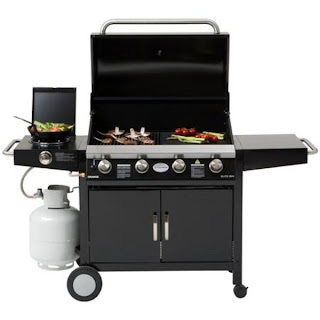 You are probably asking what is so hard about cooking a bbq dinner right? Well, AR threw me a challenge and said he wants a proper chinese meal. The 1 meat, veg and soup deal! HeLLO! I have no STOVE to boil soup in for hours to come. So when in need, pull out your magic gun thermal pot. Mum bought this for me when she realized in horror that I was losing my Cantonese roots- not boiling nutritious clean soup regularly enough. 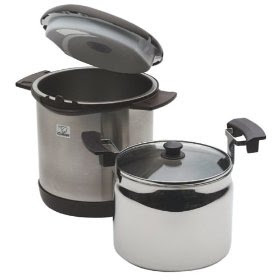 Since then, I have used this to cook curries, stews, soups, boiling it in the morning and then putting it in the magic thermal pot for a good hearty dinner at night. The best bit is it that it uses no electricity as the pot retains heat from when it is boiled. So anyhow, using the bbq wok stove burner, I boiled chicken thighs (fat trimmed, boned in), carrots, corn, celery and tomato with some gozi berries. 4-5 hours later, AR has what he asked for. SOUP. I was proud to say, the soup was a winner. Sweet and hearty. Score 1. The meat dish? That really got me. I guess I could do similar soya sauce chicken or perhaps some stir fry chicken with cashew nuts. But I had a sudden craving for steam dishes. In fact, I was thinking of making a similar dish like the one Singairishgirl made. One problem? How do I steam the meat? No way that was going to happen.. so I thought I will make a pork mince omelette instead. BUT the amount of eggs was NOT proportional to the amount of meat I have. In fact, I had more pork mince than eggs. By that time, the pork was nearly fried up…So i dished it on to a metal plate, break a few eggs into it and pop it into the bbq to use it as an instant oven. To make it look slightly better, I err…sprinkled some pine nuts over it. The veges were easy. Stir fry chinese veges with chili, garlic and oyster sauce. You can’t go wrong right? Wrong! It was over cooked. Score 0! Oh well, he asked and I delivered. Still, it was a semi decent dinner, as we sat outside our patio area, enjoying the breeze and a home bbq Chinese style dinner. This entry was posted in challenges in cooking and baking, Chinese, Dinner, Home, Relationships, Renovations, Vegetables. I;m even outside, grilling away in freezing temps, fingers turning purple. It’s crazy. Lol dear, that was funny. Well, you delivered!